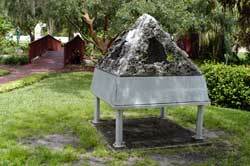 Receptualistic Pyramid, a sculpture by Johann Eyfells. Eyfells was born in Reykjavík, Iceland, in 1923. Eyfells works with a variety of media, including metal, wood, paper, plastic, and cloth, in an effort to document the interaction between time, space, and gravity. Many of his sculptures are minimal and non-objective, resembling lava or geological formations. In the 1960s, he developed the concept of Receptualism, the practice of portraying original ideas visually using non-representative and abstract forms. Eyfells considers himself more of an experimental chemist than a sculptor. Eyfells worked as an architect, artist, and teacher in Iceland before relocating to the United States. During his studies at the University of California, Berkeley, Eyfells met Kristin Halldorsdottir, a former Icelandic model and dress designer. They married in 1949 and moved to Florida together to complete their studies in 1969. Eyfells finished his degree in architecture in 1953, and in 1964, he earned a master’s degree in fine arts. In 1969, he joined the art department of the Florida Technological University (present-day University of Central Florida) and taught there for over 30 years. On retirement, he moved to Fredericksburg, Texas. Original color photograph: Crealdé School of Art, Winter Park. Crealdé School of Art, Winter Park. Copyright to this resource is held by the Crealdé© School of Art and is provided here by RICHES of Central Florida for educational purposes only. "Johann Eyfells Sculpture." Artisans at Rocky Hill. http://www.artisansatrockyhill.com/Upload/Johann_Eyfells.htm. 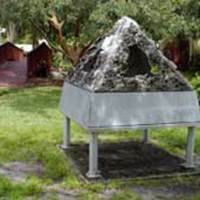 “Receptualistic Pyramid by Johann Eyfells.” RICHES of Central Florida accessed April 21, 2019, https://richesmi.cah.ucf.edu/omeka/items/show/5338.